When a cruel leader learns of an ancient prophecy that says a peasant boy shall rise to become emperor, a mighty army is ordered to murder young boys across the empire. But when the finest and most ruthless warriors reach the humble village that is home to the boy who would be emperor, he must rise to lead an army against this most fearsome enemy. Only one true warrior will turn the tide of war in this heroic quest for righteousness. If you're having trouble tracking down Blade of Kings on IMDb it's hardly surprising, as it's the latest film to get renamed by Metrodome for home video release. Mind you, it's a little tricky marketing a film whose actual title is The Twins Effect II (Chin Kei Bin 2 - Fa Tou Tai Kam), which is a follow-up to the 2003 Vampire Effect (Chin gei bin), a martial arts / horror / comedy crossover co-directed by genre giants Dante Lam and Donnie Yen that was released in the US as – yep, you've guessed it – The Twins Effect. But if you can put all that aside then The Twins Effect II, sorry Blade of Kings, has a seriously marketable cast that includes Donnie Yen, Jackie Chan, Steven Cheung, Edison Chen, Tony Leung Ka Fai, Jaycee Chan, Charlene Choi and Gillian Chung, but is one of those Hong Kong comedy/action crossovers that may prove just a little too silly for sone western audiences, though you can bet the action will be worth the wait. 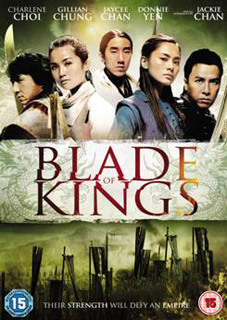 Blade of Kings will be released on UK DVD on 27th August by Metrodome Distribution at the RRP of £15.99. No extras have been listed, so just for fun, here's the Hong Kong trailer with no English subtitles.